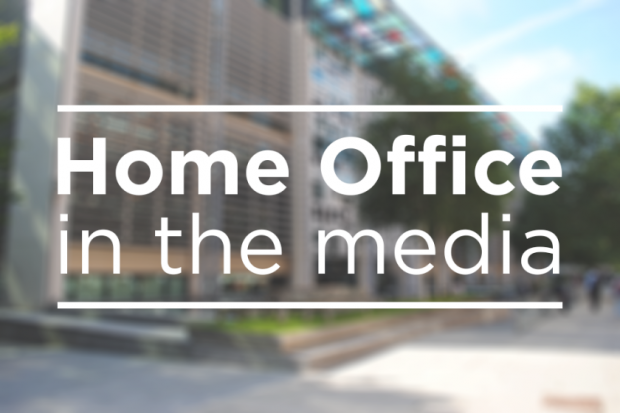 The Guardian, Telegraph, Mail, Sun, Times, Independent and Mirror report on the Home Secretary’s announcement of the opening of the Windrush compensation scheme yesterday. An op-ed authored by the Home Secretary is carried in the Independent. The Mail reports that hospitals will be told to identify knife-crime hotspots by logging those who attend hospital suffering knife wounds, even if they are not admitted. According to the article, Health Secretary Matt Hancock said the NHS needs to do more to "root out the terrible seeds of violence" and that "every part of Government has a role to play, focusing on prevention first". The Star reports that according to figures given to MPs on the All-Party Parliamentary Group on Knife Crime, hospitals are treating 21 young patients for knife injuries every day – almost one an hour. We are working to tackle the concerning rise in violence through our Serious Violence Strategy. This week the Prime Minister hosted the Serious Youth Violence Summit and the Home Secretary announced a consultation on a legal duty to ensure public bodies are identifying those at risk of becoming involved in such crime. This year, the Government has increased funding for the police by around £1 billion, including council tax and new serious violence funding. We have also committed £220m to community projects that work with young people to steer them away from violent crime, and provided support to Redthread, who work in A&E departments to engage with young people admitted as a result of violent incidents. The Sun reports that six migrants were found after they rang 999 to say they were stuck in a container in Teesport, near Middlesbrough. Border Force was contacted by Harbour Police this morning, Tuesday 2 April, after police attended an incident at Teesport Docks. Six men were taken to hospital but have now been assessed as medically fit and discharged. Their nationalities have not yet been confirmed. The men will be interviewed by immigration officers and their cases will be dealt with according to the immigration rules. What is the public health duty to tackle serious violence?